Both this Eastern Towhee and the Spotted Towhee of the West sport a black or dark brown hood and back. And when they fly, their tails flash white. When a hawk gives chase, the towhee's flashing tail-feathers draw the predator's attention. Momentarily distracted, the hawk may come up with just a couple of tail feathers — as the towhee escapes into the underbrush. So if you see a towhee missing a couple of tail feathers, it may be that the flash of white — the distractive plumage — saved its life. 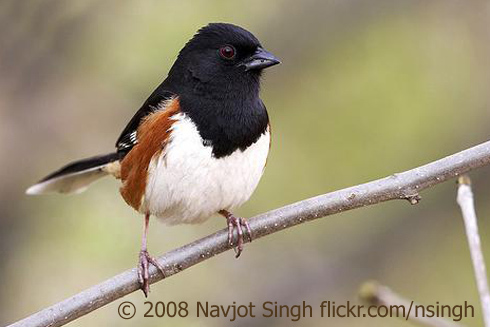 Whether you live in the East or the West, you may have seen towhees. They’re among the most widespread and familiar birds in North America. Both birds, the Eastern Towhee [Song and call of the Eastern Towhee] and the Spotted Towhee of the West [Song and call of the Spotted Towhee], sport a black or dark brown hood and back. And when they fly, their tails flash white. When a hawk gives chase, the towhee’s flashing tail-feathers draw the predator’s attention. Momentarily distracted, the hawk may miss seeing the towhee’s darkly colored head and back. As a result, the vital head and breast of the towhee remain protected. The hawk may come up with just a couple of tail feathers – as the towhee escapes into the underbrush. So if you see a towhee missing a couple of tail feathers, it may be that the flash of white — the distractive plumage — saved its life. Towhees can be easy to see, because they spend most of their time near the ground. [Leaf- turning sound and call of the Spotted Towhee] This makes them easier for kids to spot. And it makes for a fun expedition to go looking for a towhee and its flashing tail. Watch for a black and orange bird, a little smaller than a robin, scuffling in the leaves. To see photos of the towhee, come to BirdNote.org. Song of Eastern Towhee and the Spotted Towhee provided by The Macaulay Library at the Cornell Lab of Ornithology, Ithaca, New York. Eastern Towhee song ML94294 recorded by W.L. Hershberger; Call of Eastern Towhee 136264 recorded by Martha J. Fischer; Spotted Towhee by G.A.Keller ML119455. 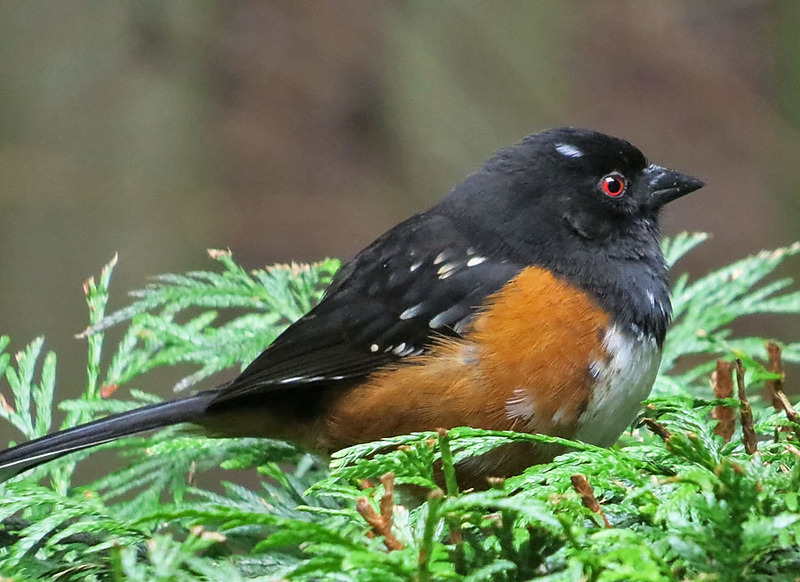 Feeding sounds of the Spotted Towhee by K. Colver.